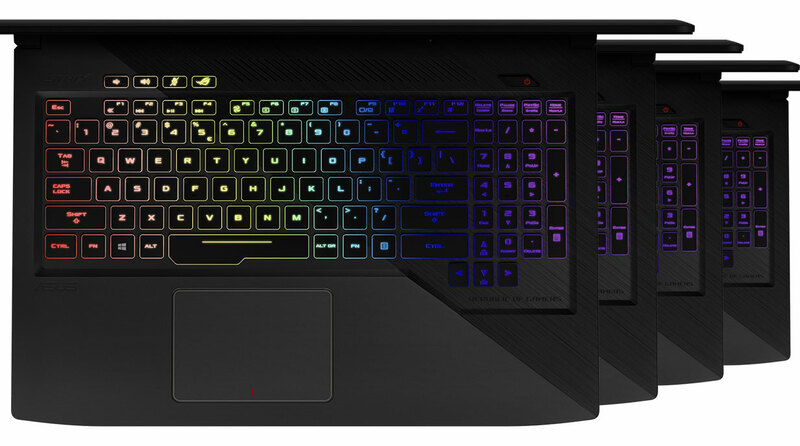 ASUS ROG GL503VD, GL503VM, GL503VS + Hero and SCAR Edition – what are the differences? LaptopMedia.comComparisonsASUS ROG GL503VD, GL503VM, GL503VS + Hero and SCAR Edition - what are the differences? We receive a lot of questions about the differences between many of the models on the market and their exact specs (btw, that’s why we built our Specs System) but we think that sometimes even the manufacturers could get confused if someone asks them some questions about a part of their own model lineups, hidden behind shiny marketing names. And if there was an award for most complex laptop line, the new GL503 would easily win it. If you’re interested in the GL703 (17-inch) versions, check this article. In this article, we’ll try to reveal everything you might need to know about all of the GL503 versions. Let’s start with that – there are 7 different GL503 series – two traditional GL503 (GL503VD and GL503VM), two “ASUS ROG Hero Edition” and three “ASUS ROG SCAR Edition” series. The latter two are sold by ASUS as different laptop lines but they’re actually GL503s with very little differences. We can put all of the GL503s in three categories – GL503VD, GL503VM and GL503VS. In terms of hardware, thе GPU is the easiest way to distinguish the models. GL503VD comes with GTX 1050, GL503VM comes with GTX 1060, and GL503VS comes with GTX 1070. The Hero and SCAR editions are actually almost the same as the traditional GL503 but with a different design. ASUS ROG Hero Edition could be either GL503VD or GL503VM and ASUS ROG SCAR Edition is GL503VD, VM or VS. As you can see at the table below, the traditional GL503VD and GL503VM have two display panels to choose from – 15.6″ Full HD IPS (60 Hz) and 15.6″ Full HD IPS (120 Hz). The Hero Edition comes only with 15.6″ Full HD TN 120 Hz (no matter the GPU), and the SCAR edition can be bought with 15.6″ Full HD TN 120 Hz (for configurations with GTX 1050 or GTX 1060), and 15.6″ Full HD IPS 144 Hz (for configurations with GTX 1070). All of the GTX 1070 models have G-Sync. In addition to the internal differences, there are some variances in the body dimensions and the ports as well. All of the models with GTX 1050 (GL503VD), no matter if Traditional, Hero or SCAR, come with Gen.1 (5 Gbps) Type-C, 3x USB 3.0, 1x USB 2.0 and HDMI 1.4. The configurations with GTX 1060 (GL503VM) come with the same ports but all of the USBs are version 3.0 (also known as 3.1 Gen.1) and the HDMI is 2.0. Additionally, the Type-C USB of the GTX 1070 models (GL503VS) is different – it’s the next generation (3.1 Gen.2) 10 Gbps and Thunderbolt compatible. As in the GL503VMs, the HDMI is version 2.0 and the Type-A USBs are 3.0. Regarding the aforementioned differences in the dimensions, here’s what’s going on – the traditional and SCAR models with GTX 1050 and GTX 1060 have 23 mm thickness and weigh 2.3 kg (5.07 lbs). On the other hand, the Hero models are 24 mm thick (0.94″). Despite being named identically, there are differences between the ASUS ROG SCAR Edition laptops even in terms of size and weight. The configurations with GTX 1070 (GL503) weigh 2.5 kg (5.51 lbs) and have a thickness of 24.5 mm. Will the 17-inch models (GL703) have the same technical specifications as these 15-inch models? Thank you so much for clarifying the specs. There was some concern around ASUS ditching the 1070 models, but it’s awesome to see the 1070 + 144hz IPS option survive! Can’t wait to hear pricing and availability for that one. I want to buy a GL503 with an IPS panel, and I’m not sure about what model I could choose. I would like the hero edition but what kind of display is it ? So, what’s wrong ? What’s right ? Howdy! The GL503 Hero Edition (GTX 1050 & 1060) comes with an 1920×1080 IPS, 120 Hz 25 ms, 72% NTSC panel. The Traditional model has the same feature, except it doesn’t have the dragon scale design on the laptop. The GL503 Scar Edition (gtx 1070 if you are also interested in) has 1920x1080p IPS, 144 Hz 7 ms, 72% NTSC (as I can remember) panel. Which model has the best color sRGB, Brightness, adobeRGB? well i am now kind of between 2 laptops the astrix gl503vd woth 100% sRGB and 74% NTSC and RGB keyboard with a 1050 (4gb) and the fx503vd with a good ips screen but not as good as the gl503vd one (not 10% sRGB and no no info on NTSC) but with a 1060 3gb well for me i really will love to get the 1060 one but i hope i can handle overheating and stuff and for the screen and RGB keyboard i can get good external ones later?? Any idea if the GL503VM scar edition with gtx1060 will be released or not? I can’t find news about it anywhere. I kinda don’t have the budget for a 1070 and i don’t want a 17 inch laptop either.That’s why I wanted to know about this. does GL503VM Hero Edition have HDR screen?